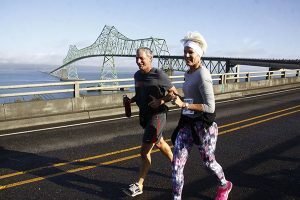 You can drive across the Astoria-Megler Bridge any day of the year, but there’s only one day when you can run or walk across – race day this year is Sunday, October 16, 2016! Take the challenge of the Great Columbia Crossing 10K Walk/Run, where everyone is welcome, from experienced runners to casual walkers, singles and families. Whatever your age – just a babe in a stroller or a nonagenerian with many crossings behind you, there’s a category for you. Age groups for men and women include 15 categories from 19 and under to 90 and over. 2016 marks the 50th anniversary of the bridge and the 35th annual Great Columbia Crossing. You begin at Dismal Nitch in Washington (named by Clark of the Lewis and Clark Expedition, when fierce winds and high waves trapped them along the rocky shoreline for six long days). The 10K course covers fairly flat terrain along routes WA 401 and US 101, except for one steep incline to the peak of the bridge. There, 200 feet above the water, unique views of the scenic Columbia River Basin below are your hard-earned reward. Then it is downhill toward the Riverwalk and Basin Street finish line in Astoria, conquering the longest continuous truss bridge in North America. When you reach the finish line, you’ll be ready for lots of pampering, and what better place for post-race comfort than Clementine’s Bed and Breakfast. Those last steps of the race will bring you to just over a mile from the bed and breakfast, and your personal ‘spa’ where you’ll be ready to indulge in your room’s luxury bath linens and accessories, spa robes, and down bedding. Then it will be time to relax on a balcony with a view of the river you’ve just conquered, or enjoy the inn’s beautiful gardens. If your whole family is planning on the Crossing, book the inn’s Moose Lodge with its Riverview Suites. This historic house on the inn’s grounds is the perfect choice for larger parties and families with children. The Great Columbia Crossing 10k Walk/Run is an OFFICIAL USA Track & Field Certified Event. Please visit the Great Columbia Crossing website for additional information and to register for the event. Children ages 8 to 17 must register as a participant. Children younger than 8 will also be allowed to participate, but do not need to register. Children must be accompanied by an adult at all times. This entry was posted on Thursday, September 29th, 2016 at 4:29 am and is filed under Clementine's Bed & Breakfast News, Events. You can follow any responses to this entry through the RSS 2.0 feed. Both comments and pings are currently closed.